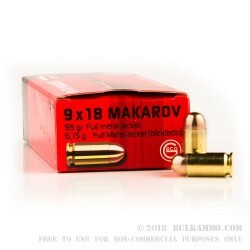 This 9x18mm Makarov cartridge is made by GECO, a European company with over 100 years worth of experience making a great variety of ammunition. 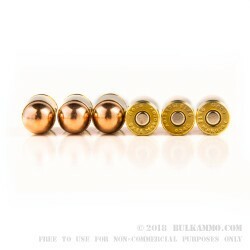 They emphasize innovative design, very strict quality control, and cutting edge technology to make their ammunition, and this round is a great example of GECO’s commitment to quality. 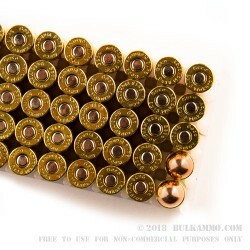 This match grade round features a 95 grain bullet with a full metal jacket. That makes it ideal for a lengthy target shooting session, as it will prevent lead fouling from impacting its consistently tight groupings. With its non-corrosive Boxer primer this round is as safe in your magazine as it is in its box, and its factory new brass casing is completely reloadable. 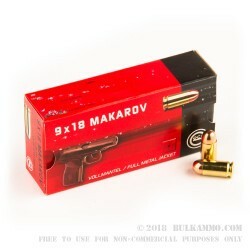 If you are a fan of Soviet era sidearms, then you’ll enjoy firing this quality round tremendously. With 500 of them to go through, you’ll be set at the range for a long time to come.